The Battle of Catraeth has been long remembered in Welsh poetry, but the exact details and circumstances surrounding this important event are not fully recorded. The Tradition: The Battle of Catraeth is recorded in a poem called 'Y Gododdin' attributed to the great Welsh bard, Aneirin. The title means 'The Gododdin[ians]'. The poem survives in two 13th century versions, both slightly different, which are known as A & B. Version B is the shorter, but older and perhaps more reliable version. The language used suggests it is a copy of a 9th century version of an early 7th century oral original. Version A is purely 13th century in style and includes some details not mentioned in Version B. The battle is generally accepted as an historical battle that took place between 300 mounted British warriors of Gododdin (Lothian) and the Anglians of Deira supposedly numbered between 50 & 100,000. The poem records that the Gododdin force included warriors from across both what is now the North of England/Southern Scotland and North Wales. The Deiran force appears to have included at least some British warriors from Rheged and possibly also Anglian Bernicians. The Gododdin warriors were sent into battle by a certain Mynyddog Mwynfawr (the Wealthy) who, for a whole year, paid them for the task ahead by feasting with them at his palace at Din Eityn (Edinburgh) - today the site of Edinburgh Castle. His three generals leading the army were Cynon, Cynri and Cynrain. The battle was a disastrous defeat for the British: either only one or three of them survived. 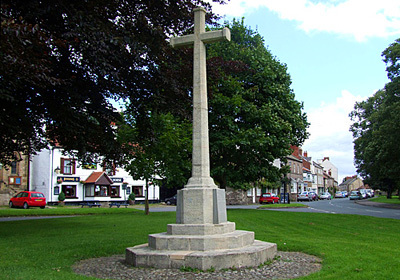 Battle Site & Philology: The battle site is not known for sure, but there is a general acceptance that it is probably Catterick in North Yorkshire. This was first suggested by Thomas Stephens in 1888 and has since been endorsed by the eminent historians, Sir Ifor Williams and Kenneth Jackson. The identification, is not without problems, although these may not be insurmountable. The Gododdin were "defending their land," but had to cross "over their boundary" to do it. Philologically, there is no objection to the development of Catraeth from Cataractonium which was the name of the small Roman fort and associated 'vicus' or civilian settlement at Catterick. There is considerable evidence for a continuance of occupation into the early Sub-Roman period in the latter area: a very late Roman apsidal building had occupational material build up into the 5th century and was then replaced by wooden structures on a different alignment, while similar buildings found elsewhere may be of the same date. However, it is uncertain whether these could have lasted into the late 6th century. Catterick was certainly in a strategic position, just south of where Dere Street, running north from Caer Ebrauc (York), divided to head for either Caer Cori (Corbridge) or Caer Ligualid (Carlisle). In the poetry of Taliesin, Catraeth is said to have been ruled by King Urien of North Rheged. It is clearly difficult to establish the exact political situation in any part of late 6th century Britain, but in the central region of Northern Britain, straddling the Pennines, it is especially unclear. A lot of the time, the area may have been largely leaderless, with greater monarchs from elsewhere claiming overlordship in regions traditionally considered British, yet soon to become Anglian. Possible Interpretations: The Y Gododdin poem has been dated to around AD 600, while the events it describes probably happened some time in the previous twenty years. If the battlefield was indeed at Catterick, however, why this was so far from Gododdin itself requires some explanation. The post-Roman kingdom of Gododdin is generally considered to have been centred around what we now call Lothian, probably with its 'capital' at Din Pelder (Traprain Law near Haddington). The line of kings there is well recorded. It does not include a Mynyddog. John T Kock theorises that Mynyddog Mwynfawr is merely a personification of Din Eityn itself, as the host of the warrior band. The Welsh mynyddog, meaning mountainous, would refer to Edinburgh Rock on which stands the present castle. True, as a pedigree and not a king list, the line of Gododdin would not record any sibling monarchs, but it is likely that the King of Gododdin at this time was a man named Cathen ap Cawrdaf. Furthermore, the Catraeth general, Cynon, was the son of Clydno Eityn, a prince of adjoining Strathclyde whose epithet would suggest that it was he and his son who ruled the area around Din Eityn (Edinburgh), not Mynyddog. Perhaps it was a sub-kingdom of Gododdin. In fact, the heart of Gododdin was, at this time, probably already called Leudonia, after its late 5th century king, Lleuddun Luyddog (alias King Lot of Arthurian legend). This is from whence the name Lothian comes. The name 'Gododdin' seems to have referred to a somewhat larger area. This makes perfect sense when one remembers that its people (and its name) stem from the Iron Age tribe of the Votodini, whose territory spread from the head of the Firth of Forth all the way down what's now the Northumberland and Durham coast. So the people of the kingdom of Bryneich, though ruled by a Coelling, would have been considered part of 'the Gododdin'. The Lothian kings may even have thought of themselves as overkings there. With Bernician Anglians already expanding their control within the kingdom, naturally, the Goododdin would want to protect the main communication links with their fellow Britons further south. If the major junction just beyond the Bryneich border had been taken by the Deirans, this would require a reactive strike. © Nash Ford Publishing 2016. All Rights Reserved.